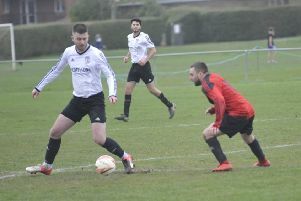 One of Bexhill United Football Club’s top performers this season suffered a painful injury in a friendly on Tuesday night. Nathan Lopez, who has been consistently impressive as an attacking left-back, dislocated his knee during the early stages of a fixture at home to Westfield. Lopez went to hospital while the match was still going on, but tests revealed no lasting damage and Bexhill hope to have him back in action soon. Bexhill manager Ryan Light said: “It happened after about three minutes. Nothing malicious. As the ball went past, he went to turn and went down in a heap. He dislocated his knee and was screaming. “Claire (Barham, Bexhill’s physio) attended to him and after about five minutes we put him on the stretcher, took him in the clubhouse and she’s treated him while on the phone to the hospital. “She got his knee back in and it seemed fine, but then after about 20 minutes it started popping out again. He was taken to hospital, was seen quite quickly, it’s all back in place and there doesn’t appear to be any ligament damage. Lopez is expected to miss Bexhill’s trip to Wick in Southern Combination League Division One this coming Saturday, but Light hopes he’ll be back for the home fixture against Littlehampton Town on Saturday March 30. 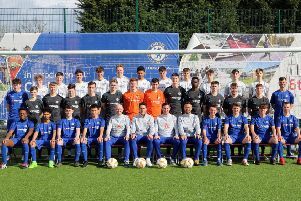 Division Two team Westfield led 2-0 at half time through a pair of tremendous finishes from Canadian hot shot Levonte Johnson, but Bexhill hit back in the second half to win 3-2 via a brace of Jamie Bunn goals and Jack Shonk’s winner. Bexhill arranged the game to get some match practice having played just twice since February 9 as a result of several blank weekends in their fixture list.